We would love to have you join us for coffee and donuts immediately following each Sunday morning service. Please join us for our FIRST SUNDAY FEAST immediately following service on the FIRST SUNDAY of each month! The next one is Msy 5. Get your Lenten Mite Box. On Easter Day we will place our boxes at the Flowering of the Cross. The offerings from the mite boxes will be sent to St. Vincent's School for the Handicapped in Haiti. ORDINATION & CONSECRATION of Phoebe Roaf on Saturday, May 4 - 11 am at Hope Church, 8500 Walnut Grove RD. She will become the 4th Bishop of the Episcopal Diocese of West Tennessee. BIRTHDAY SUNDAY on the 3rd Sunday of the month is a new ministry at Holy Trinity. Those celebrating a birthday each month are sent an invitation to receive a blessing during the service and then join with everyone in The Columns for a birthday cake and other goodies. For May, that will be the 19th. READING RAMPAGE! The April 6th Reading Rampage was a great success with 20 participants. Look for the next session which will be in the summer. The workshop focuses on reading for speed, efficiency, and comprehension. Ages 9 to adult are welcome! CLICK to REGISTER! VESTRY MEETINGS are held immediately following service on the second Sunday of each month. However, the April/May Vestry Meeting is a combined one and will be April 28. BIBLE STUDY – Please join us each Wednesday morning at 11am for our weekly Bible Study. This group studies the Gospel Reading for the upcoming Sunday. FOOD BAGS. We have food bags available for people in the community who need assistance. If you would like to have a bag(s) to give out, please see Cathy Williamson. CATECHESIS OF THE GOOD SHEPHERD is offered each Wednesday afternoon from 2:30 until 4 for students of St. George's Memphis Campus. Brenda Echols is the Catechist and is assisted by Father Cubine and Ty Legge. 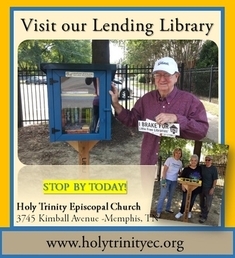 Stop by our LENDING LIBRARY in front of the sanctuary by the driveway, thanks to a generous donor and the skills and hard work of Tommy and Brenda Harris! Please save the books that you or your children have read and loved to donate to the Lending Library. Trisha Horton makes certain we have the shelves full of books. "Celebrating over 110 years of serving our community"
COPYRIGHT © 2018. Holy Trinity Episcopal Church. All Rights Reserved.